If a file with the same name as the fi le being copied is present at the destination, Windows asks if it should overwrite this fi le. What is annoying is that you have to confi rm every confl ict separately. Using a secret, undocumented command, you can instruct Windows not to overwrite even a single fi le during the entire copy process. 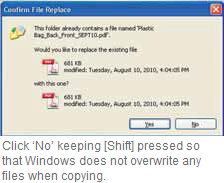 As soon as Windows shows the ‘Overwrite’ message in the fi rst confl ict, keep the [Shift] key pressed and click ‘No’. The operating system now copies all fi les that are not yet there at the destination.